See the moon as you've never seen it before, and fly there on Orion—the spacecraft that will take future explorers into space. Moon phases, eclipses, craters, tides, and the dark side—all come to light in this lively lesson with NASA astronaut LeRoy Chiao, host Katrina Miller, and University of Colorado Professor David Klaus. Mira la Luna como nunca antes la has visto y llega hasta ella en Orión la nave espacial que llevará a los futuros exploradores hacia el espacio. Las fases lunares, los eclipses, los cráteres, las mareas y el lado oscuro, todos cobran vida en esta animada lección con el astronauta de la NASA LeRoy Chiao, la anfitriona Katrina Miller y el Profesor David Klaus de la Universidad de Colorado. Join us on a most unusual expedition, to learn about gravity, velocity, the electromagnetic spectrum, and the speed of light. Our journey focuses on high-energy radiation including gamma rays, x-rays and cosmic rays. This course places students in the midst of a challenge to save Earth from Apophis, a real asteroid that could be on a collision course with Earth. 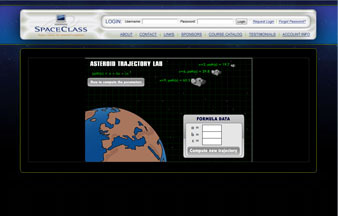 Students learn about the composition, history and orbits of asteroids, and they decide how to deal with Apophis. 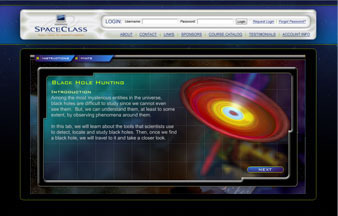 Dr. Neil deGrasse Tyson, director of New York City's Hayden Planetarium, guides students on this adventure. This course is offered at two levels: Novice and Expert. 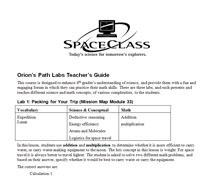 This course is a gem for middle school science classes. 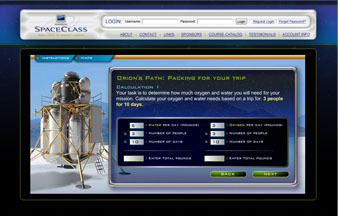 It teaches students all about the Red Planet and its place in our Solar System. Maggie, our young host, reveals intriguing facts about orbits, the distance from Earth to Mars, the time it will take to travel from Earth to Mars, and how to calculate the amount of fuel needed for such a trip. A wonderful journey in biosciences, this course presents the skeleton and everything related and connected to it in fun videos and interactive projects. This course presents informative and entertaining segments on how bones, ligaments and joints work with other systems in the body, why they are so important, and the impact of space travel on these critical elements of the human body. Each lesson is a multi-media program using an instructional video featuring a diverse crew of young hosts, NASA astronauts, and experts like Dr. Neil deGrasse Tyson to liven up our topics. 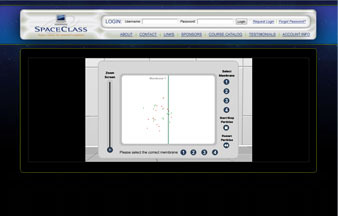 Interactive Virtual Labs are furnished with a Teachers guide which lists key concepts and requirements and solution guidance. 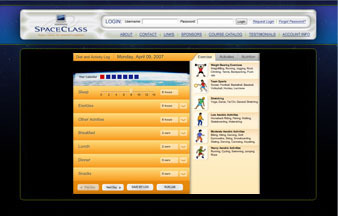 Check the Lesson Resource section for more information. Copyright 2010, Space Class. All Rights Reserved. Website Design by FX one seven zero.